This past weekend I had a reunion of sorts. Not with college or grad school classmates, mind you, but with one of my favorite French producers from the Languedoc, Chateau Sainte Eulalie, located in the rugged, herb-laced hills of the Minervois La Livinière appellation. Minervois forms a large, vinous ampitheater that stretches from the famous Canal du Midi north to the Montagne Noire, the southern edge of the Massif Central. It is endowed with consistent sun and warmth during the growing season; cooling winds from the inland mountains; just enough winter rain; and diverse geology and topography. Chateau Sainte Eulalie fully benefits from this fortuitous “terroir” mix, which makes for naturally healthy vineyards, where synthetic pesticides and chemical applications are rarely necessary. I first encountered Sainte Eulalie’s wines — as well as its soft-spoken owner, Isabelle Coustal — at a Languedoc tasting in Manhattan about a decade ago. Her silky, harmonious and fruit-driven wines immediately caught my attention, and I kept up with the Chateau for a number of years, including on a trip to southern France and Languedoc-Roussillon. There I had the opportunity to dine with Coustal and other Minervois producers one evening in La Livinère itself, a memorable evening of great food and wine in the heart of Minervois — an ideal setting to make compelling wines. Over the last five years or so, however, I had lost track of Sainte Eulalie. It wasn’t available in any of the wine shops I frequent in the Hudson Valley (where I buy most of my wine) or in NYC, and you know how it goes — out of sight, out of mind. But during a cold snap in January, with hearty stews on my mind, Sainte Eulalie bubbled up in my brain on a visit to Sipperley’s Grog Shop in Red Hook, NY. Occasionally, I suggest wines for them to try and/or to bring into the shop, so I recommended Eulalie, if they could find it and it could be distributed upstate. Apparently, it wasn’t that easy to locate, but Sipperley’s was dogged, and not only did they find it, but they also conducted a successful tasting with it. Naturally, I picked up a bottle when I spotted it in the shop last weekend, a reunion I had helped to effect! Sipperley’s selection was Chateau Sainte Eulalie’s inexpensive ($13.00), early-drinking red, “Plaiser d’Eulalie” (the “pleasure of Eulalie”) 2014. It consists of 30% Syrah, 30% Grenache and 40% old-vine Carignan, which was grown on terraced south-facing vineyards with pebbled top soil, and a high percentage of clay and limestone, rich in manganese. 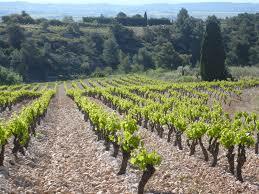 The “Plaiser” has an intense nose of black cherry, dried herbs (especially thyme) and licorice. Medium-bodied, it has rich black cherry jam, plum and pepper notes on the palate, with good acidity and soft, silky tannins, finishing long and clean. Quite a mouthful for $13.00, and a highly compatible partner to a Merguez sausage melange of white beans, mustard greens, chilies and tomato sauce, along with a baked sweet potato. If you like Eulalie’s “pleasure”, then you’ll really dig its consistently excellent, regal and Syrah-dominated “La Cantilène” bottling, which is a notch up both in terms of quality and price (around $24.00). 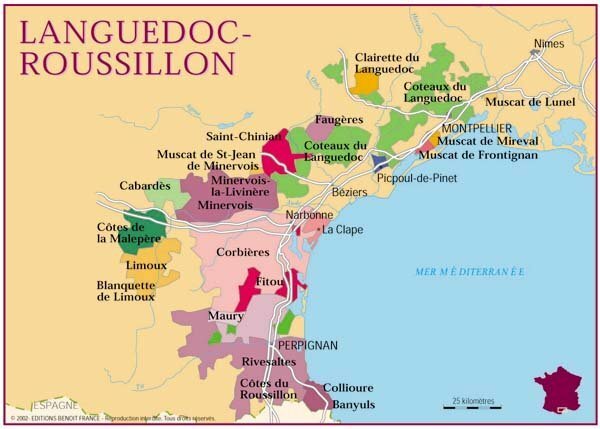 This entry was posted in At Our Farmhouse, Wine, Wine + Food and tagged Chateau Sainte Eulalie, Isabelle Coustal, Languedoc-Roussillon, Minervois La Liviniere, Plaiser d'Eulalie 2014, Sipperley's Grog Shop. Bookmark the permalink.